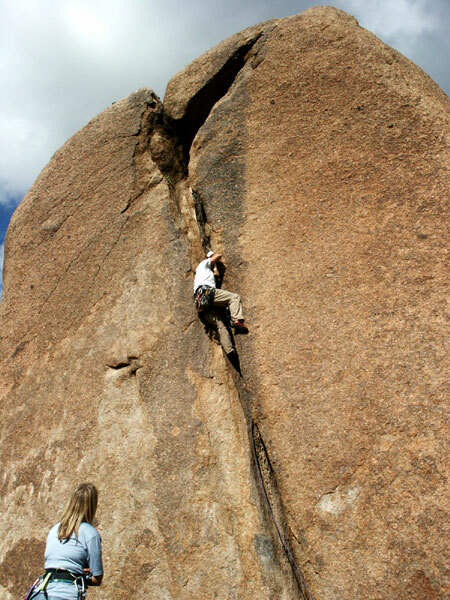 Y-Crack is a Pinnacle Peak classic and a striking line on the Y-Crack boulder, which sits on a prominent knob just northeast of the main Peak area. I don't think the line gets any traffic at all, and I was a little surprised to note that some of the rock had decomposed and was a bit grainy when I did it for the first time (2004) since Pinnacle Peak was closed. I don't recall it being that grainy when I'd last done it in 1994, but in 2004 I had a bit of rock sloughing off under my shoes. So a little care is recommended so you don't come flying out due to the wrong crystal bailing under your foot. To get there, park in the lot at the Pinnacle Peak Park Visitor's Center, just off Alma School Road near where it intersects with Jomax Road in northeast Scottsdale. Hike up the main trail, passing the climber's trail that heads up to the Peak, and take the side trail that heads to the Cactus Flower East and Y-Crack areas. 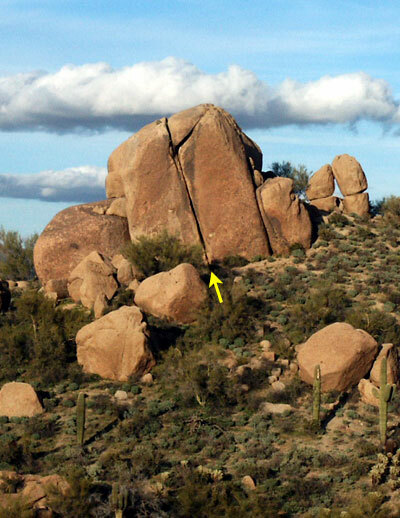 Take the right fork and hike over to Y-Crack Boulder. You'll be right at the base of the route. Can't miss it. The crack itself runs from about 9" at the bottom, pinching down to hands and even finger-sized pieces near the top. The good news is that by the time you need pro, you can use a #5 or even #4 Camalot. This piece can be walked up (if needed) with you as you climb, with smaller gear coming in to play in the upper portion of the route. Climb up the wide stuff to where it goes hand size, dumping you in the bottom of the "Y". Watch out here as owls have been known to nest in this area and there can also be the odd cactus to deal with. 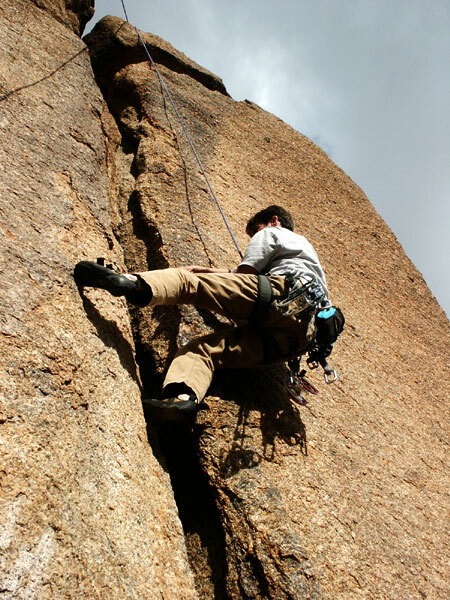 From the bottom of the "Y", work up and left to the vertical crack leading to the summit of the boulder. You can use pro and the odd bolt for an anchor. The route faces generally south and will be a sweatfest in the warmer months. As you have to get your body parts in there, the cooler times of the year are great for the route, as you will be wearing extra clothes to keep the carnage to the minimum. As there is a pretty decent edge on the right side of the crack, some might get the idea this route ain't all that hard after laybacking up it on toprope. Bear in mind, you can't really place gear all that easily from a layback position! 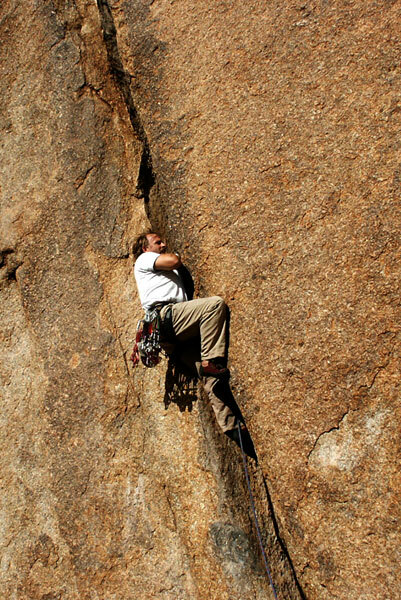 Although it is a fairly safe lead if you have the requisite gear, it can also be toproped pretty easily by climbing Turtle Piss (5.6) or Corona Club (5.8+), two bolted face routes on the opposite side of the Y-Crack Boulder, and then setting up the TR once on top. You will need some fairly long slings to set this up with a clean running rope. Other than this, the only advice I can give is: don't be afraid to get in there and work for it. Oh, and don't thrash.